Since we got chickens our vegetable garden has been looking less than full and while it is winter here lettuce still grows well and we eat a lot of lettuce which we prefer to grow ourselves than buy. 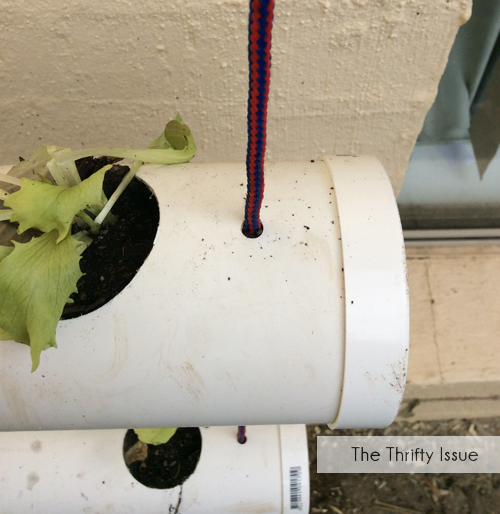 My hubby and 7yr old worked out an easy PVC pipe hanging planter that holds 36 lettuce so it should keep us going. Figure out where you are going to hang it and how big you are going to make it. It can be as small or large as you want. Ours is hanging between windows so we made it a bit smaller than the gap. Cut your pipe to size and use the drill and cutting tool to make large circles where your plants will go. Next drill holes in either end for the rope to thread through, then start threading your rope. 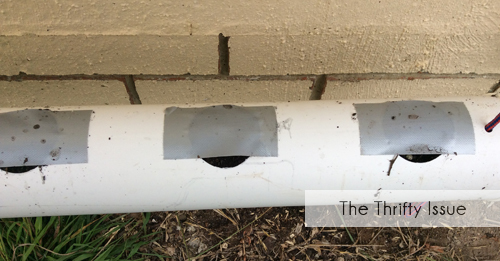 You will need to tie a knot at each hole to space the pipes and hold them apart. Hubby tied the knots inside the tube so it looks neater but its easier to tie the knots on the outside. Glue or screw a cap on one end and tape up the holes you just cut. Stand your tubes on the cap end and fill them with dirt. Put the other cap on but make sure at least one of your caps is removable so you can changed the dirt as needed. Hang the planter from something strong. 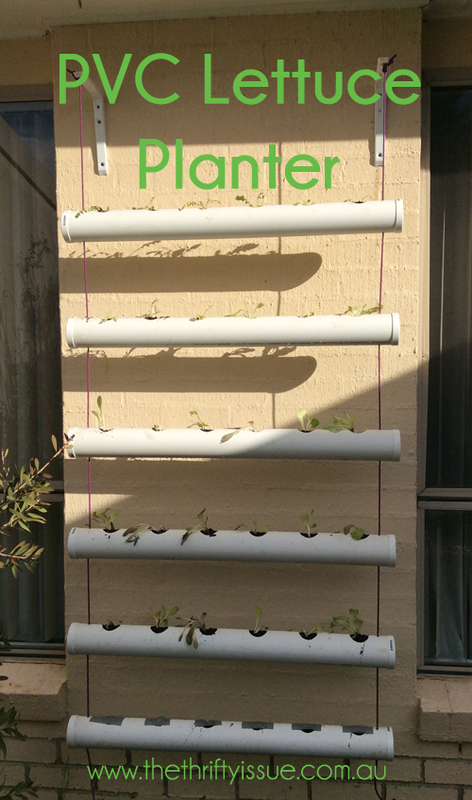 We screwed brackets into the wall and tied our planter on. Remove tape from the holes and plant your lettuce. Give the plants a good water and your done. You could grow a number of things in these planters: lettuce, rocket, herbs and strawberries all would do well. We also use the lettuce where you pick a leaf a day and they continue to grow for a long time instead of picking one head and being done. Do you have a garden? How do you grow your lettuce?